Barcelona, Part 1: La mevas primeras impressions de Barcelona. I will be returning to my favourite stomping ground for the amazing 10th visit from November 6-9 to see the indescribable Lady Gaga in concert for the third time. Barcelona is an incredible city with the world’s best fútbol team (Més que un club!) with a ton of history and culture and places to be discovered. To commemorate this remarkable occasion, I’ll be doing a series of blogs this week about my third favourite city in the world. It was in 2003 when I traveled to Barcelona for the first time. I was a very young and naïve 21-year-old, about to have the first hostel experience of his life, traveling alone for the first time in his life, and exploring the streets of a foreign city on his own for the first time in his life. My Spanish level was a lot lower than I thought it was (I don’t even want to read any Spanish I wrote from that time in my life!) The memories I have from this first trip? I took a boat cruise along the harbour, climbed the Statue of Christopher Columbus, went to the Museu de Picasso and walked along the streets of Barceloneta. I fell in love with the Mare Magnum and spent a lot of time people (and hot boy) watching on the Pont Les Rambles del Mar. I walked a whole kilometre from Mare Magum to Plaça de Catalunya. I explored the Olympic Stadium on Montjuic. At night, I went to my very first gay disco, Arena. I stayed up all night two nights in a row and barely slept. 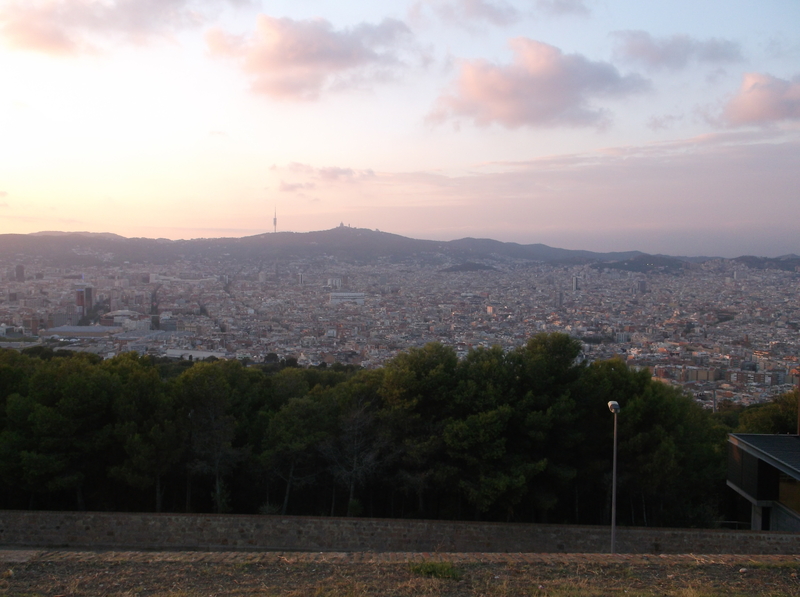 As the sun was setting over Montjuic, I realised something. I wanted to live in Spain. More specifically, I wanted to live in Barcelona. I loved everything about this city. It was love at first sight. And CATALÁN WAS THE COOLEST THING EVER. As I was studying Spanish for a semester in Toledo, I would later be convinced that it was Madrid that I wanted to live in, the Catalán language was evil and the Cataláns were even more evil, and Madrid was where I needed to be. They were totally wrong, and my Spanish dream became converted into Madrid. That Spanish dream turned into a nightmare for so many reasons. 11 years later, I am returning to Barcelona for the 10th time on the weekend some sort of something about something that I don’t think anyone in Catalunya can explain is going to take place on 9N (November 9) about whether they want to stay in Spain. The whole thing is illegal, and I can’t for the life of me figure out what is actually happening as it changes hour to hour. I’ll be on the bus back to Bilbao as the whole thing unravels. The hostel I stayed in that trip is no longer in business (no big surprise there), and Barcelona has changed tremendously in the past 10 years as now you are more likely to hear English than Catalán or even Spanish in the streets. I find it offensive to enter a bar and be greeted in English when I want to practice el meu català. The city feels less Spanish and Catalán than ever and more international-could-be-anywhere do to the hordes of tourists. I have never quite been able to make Barcelona my home. I now speak Catalán, I support FC Barcelona with all my heart, despite their treatment of David Villa grrrrr, and along with Madrid and Valencia, it is one of the cities I can say I have been to every year that I’ve lived in the Greatest Peninsula of the World. Who knows what the future has in store for me? However, thanks to the fact its new just-like any-European-city-due-to-more-tourists-than-residents vibe (I’m so anti-globalization and so KEEP YOUR CULTURE), if I ever to migrate to Catalunya, I’ll be more like to be in Girona. I just did a look back on my private, for myself blog, which I’ve kept since 2001, and I found something I want to share. I’d like to believe my writing has improved some in the past 11 years. I know my Spanish and my travel skills have. From Oct. 26, 2003…my first impressions on the capital of the Catalán world. Last night, I was sitting at a gay bar in Barcelona, sipping my Barcardi Breezer Sandia (watermelon) that the bartender recommended. And I saw him. My dream boy. The guy I could spend the rest of my life with. There were sexier boys there, but sexiness is not the main quality I want in a boy. He was cute, definitely. He had the brown hair brown eyes (¡Era un morenito!) that is “my type” of boy. The more I watched him, the more I could tell he was what I wanted in my dream boy. Just the way he talked to his friends, his mannerisms, etc. You could tell he was quiet, intelligent, spoke Spanish (obviously), and had the qualities I would want in a guy. I left without talking to him. Of course, what did you expect from me? Do I regret it? Not really. I would’ve loved to have talked to him, but he was in major conversation with his friends. (An excuse). Although I want a relationship really bad, I don’t want the man I’m going to spend the rest of my life with to walk into my life right this second. I’m not ready for it. Yet it would be wonderful to have him in it. And Barcelona, you ask? It has replaced London as my favourite European city, and yes, after a nine-year ride at the top, has probably knocked Seattle as my all time favourite city. It was just amazing. Except for the prostitutes trying to pick me up on Las Ramblas. I could definitely live without that. I saw so many beautiful things while there, and I had a blast. I could and probably should go into details, but I don’t really have time and that sort of stuff goes into my travel journal. I got to see a hot Canadian shirtless this weekend. Hostels aren’t all that bad. I went out to the gay bars and discotecas both Friday and Saturday night. The gay salsa discoteca was probably the best one. I even danced there. If you paid 5€, you got a free drink and could go to any of the four Arena discos all located on the same block. The one Arena left a bad taste in my mouth both nights. I spent about 40 minutes crying in the corner last night for reasons I’m not getting into at this moment in time. And this afternoon I woke up to a chico guapo de España next to me. Oh, don’t get excited. I took a nap on the train back. The more things change….the more the stay the same. I adore Barcelona! 🙂 And Catalunya in general. I was living there for 3 years and when I had to leave the city was the saddest day of my life! However, I visit it 2 or 3 times every year! I’m jealous you had the opportunity to live there. I haven’t had the chance, but I visit a much as possible. Thanks for reading!